Healthy, delicious, crunchy salad. Sticky, tangy, spicy sauce. Easy recipe! 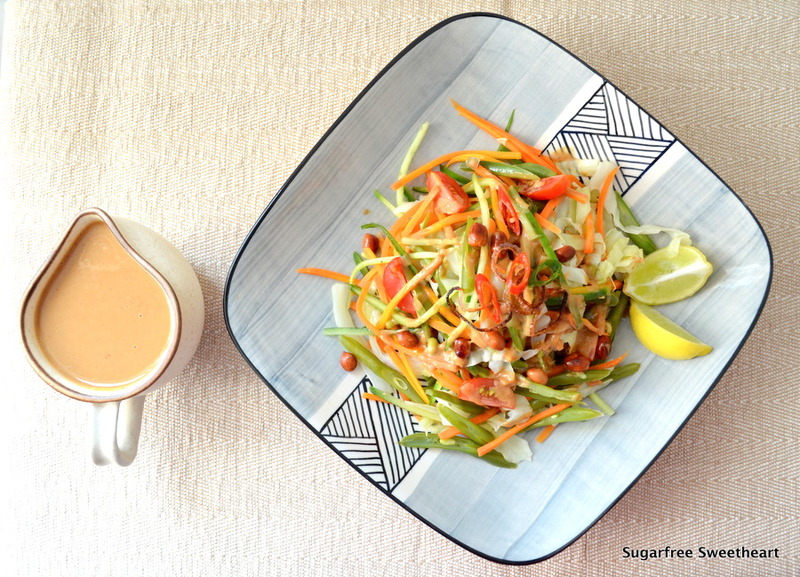 Gado Gado is an Indonesian salad made with steamed and raw veggies, topped with a creamy peanut sauce. I made this Gado Gado salad for the Keli Paan Cooking Contest, which is hosted on Facebook by Anitha from Keli Paan. It is a Cook-Click-Win contest where contestants cook the same recipe and photograph it. The best photo wins and the winner gets to come up with the next recipe. It’s a simple and fun way to interact with bloggers and non-bloggers alike! Since I won KPCC-5 (which was Sonal‘s recipe for fried rice and tofu salad) I got to set the recipe for KPCC-6. This salad is suitable for diabetics, salad enthusiasts, and peanut butter maniacs! Ingredients and recipe – all in one illustration. Just click to ENLARGE! Forgive my scrawly handwriting in the recipe above! I was trying something new with the format, so by the time I came to the end of the page I was scribbling a bit! Anyway, now I know I should stick to hand drawn illustrations, and use the computer to type the text from next time! I had gado gado in Singapore and fell in love. Your method of describing the recipe is very unique. Love it. first time on your blog and off to explore around. Hi Priya, I have given you the Imagine Award. Poppy! Thanks so so very much! Yay! Love the name of this award! 🙂 I have been away lately and also working hard behind the scenes for the changes on the blog in 2014 so I’m sorry that I took so long to respond. I’m thrilled that you thought of me! 🙂 Thanks again and congratulations on your award! Hi Priya! No worries at all! I look forward to the exciting changes! I made your divine recipe too & loved it so much! 🙂 A Happy 2014 to you & your loved ones! I regularly go to a great Indonesian restaurant, and always have gado gado there. This recipe looks fantastic too, and I’m looking forward to making it. Great post! This sounds like a perfectly light and refreshing dish to balance out all the rich holiday treats I’ve been indulging in lately! 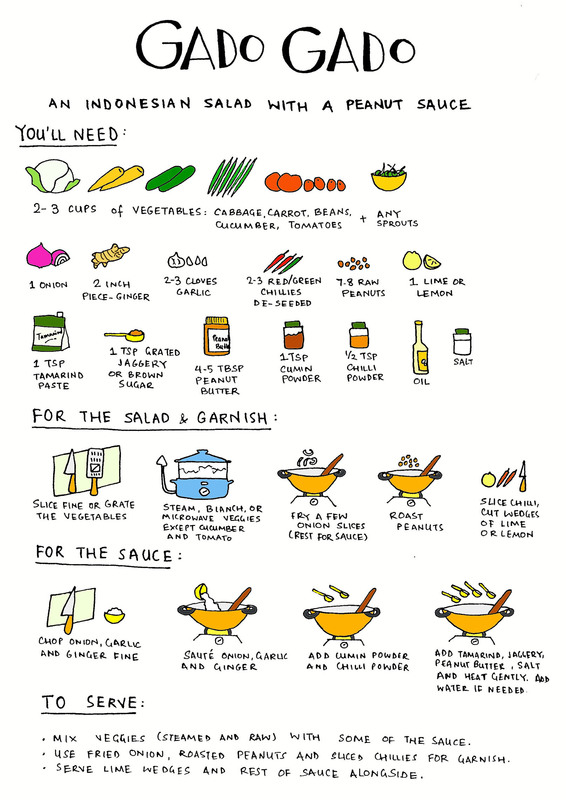 Plus, I simply adore your recipe illustration. So creative, cute, and informative all in one neat little package. This sounds amazing! Love the illustration too — super cute! Yum!! I love Gado Gado! So great to have a recipe for it now! 😉 Thanks for sharing Priya! As always – lovely illustrations! thanks for an easy and tasty salad recipe. the photo looks beautiful. I used my new-ish julienne cutter for the veggies. It’s the one piece of chef-y equipment I own! The PB dressing sounds heavenly! It is! And it’s a nice change from vinaigrette and olive oil dressings! I have always loved the presentation of your awards.. Another awesome presentation :). I know :). You are really a sweetheart!